World No 1 Simona Halep has pulled out of the Kremlin Cup as she has not fully recovered from a herniated disc, she said on Twitter on Tuesday, casting further doubt on her participation in next week's WTA Finals. "I really wanted to play here in Moscow, but unfortunately my back is still causing me pain and I don't want to take any unnecessary risks," Halep, who will still end the year as women's world number one, tweeted on Tuesday. "While it's disappointing to withdraw, I know it's important to put my health first," the 27-year-old added. 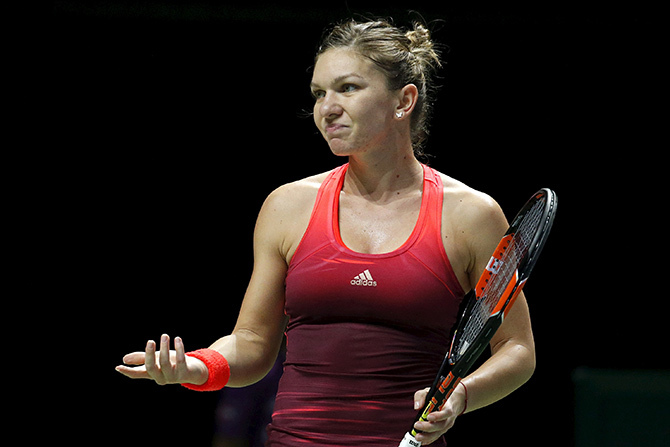 Halep had said on Monday that she would be "very doubtful" for this month's season-ending WTA Finals if her injury prevents her from playing in Moscow. The French Open champion, who claimed her maiden Grand Slam title this year, was the first player to qualify for the October 21-28 event in Singapore. Sumit Nagal suffered yet another first round exit, albeit, after a valiant fight, while Saketh Myneni suffered a tame defeat as India's singles challenge shrunk at the ATP Ningbo Challenger on Tuesday. Nagal, who has been struggling for good results this season, lost 6-4, 4-6, 2-6 after battling for little over two hours against third seed Thomas Fabbiano in the opening round of the US$150,000 tournament. "It was a good match which moved indoors after rain and it worked in his favour. Both of us played at a high level but I was unable to sustain towards the end of the second and third sets," Nagal told PTI. Myneni, who had qualified into the singles main draw, lost his opening match 3-6, 2-6 to Renta Tokuda in one hour and 17 minutes. Ramkumar Ramanathan had also lost his first round, leaving only Prajnesh Gunneswaran as the only Indian left in the singles competition. Both Nagal and Myneni are also featuring in the doubles draw with their respective partners. Throwback Monday: Virat Kohli shares a rare pic!